Recommended for air, oil, gas, and water, for pressure or vacuum hookups, on test stands, beverage and fluid line connections. 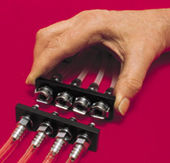 Quick, convenient multiple couplings connect and disconnect several tubing lines at once and are easily made up from standard OMEGA ® Quick Couplings. Multiple mounts are available in thermoplastic or chrome-plated brass, 1/8" and 1/4" flow sizes. Various materials, flow, weight and space requirements are accommodated. 참고: Comes with complete operators manual. Download PDF for complete product specifications.